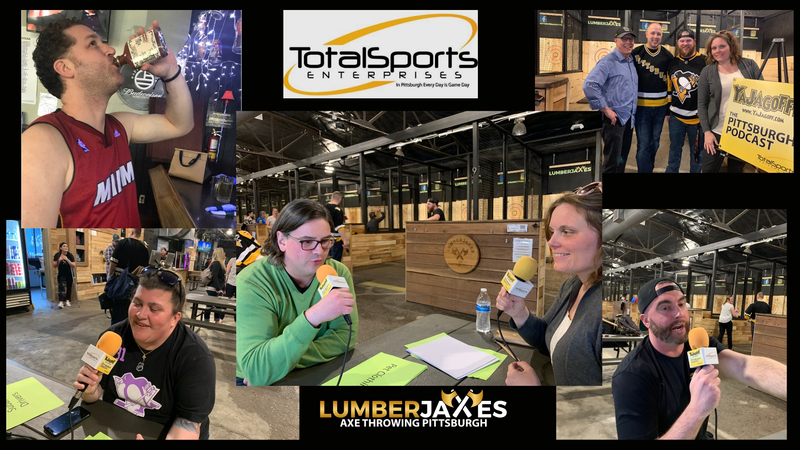 Summary: The jagoff team became lumberjaxes in Millvale and learned what a growing trend in entertainment and competition it has become. Owner, Jack Welsh, along with regular patrons Jake Knobeloch and Dave Alviso give us the inside scoop on axe throwing and its lure. Rob Rossi from The Athletic didn’t throw axes but he did throw down his order of jaggoffery for our bracket. We also welcomed Cousin Lisa of Sin Bin Kreations who has a new website to house all of her hot products, and speaking of “hot” products, we chatted with hot sauce extraordinaire Anthony Edmonds about his Fairy Tales hot sauce line. Listen to the podcast by click the PLAY BUTTON below. Don’t see the play button, above, in your email? Click the one below to listen while you get ready for tonight’s Pens game! SPONSOR: Total Sports Enterprises has had 2 weeks at its new location off of Campbell’s Run Road. While spring cleaning, we found gems in colors of black and gold and those Steeler, Penguin and Pirate items can be at your next auction. TSE has auction options for any fundraiser, big or small. Visit our new location at 100 Business Center Drive or always go to TSEShop.com. 01:23 Intro with John and Rachael readying for their FIRT axe-throwing experience. 04:24: Jack Welsh, co-owner, LumberJaxes: The comedic Welsh boys are becoming regulars on our podcast and this sibling is known for his axe throwing locations and knowledge of axe throwing stance, strategy and how to entertain people at his multiple locations. From organized parties, to a stress reliever option after work, throwing axes is more than a trend. 12:52 Rob Rossi, TheAthletic.com: Our reporter friend paid us a visit to discuss his newest publication, The Athletic, where he can lend his writing and sports knowledge in more of a profile structure. He also appreciates the human-interest part of sports’ stories, and more than appreciates the art of what turns people into jagoffs. Was he on Team Rach or John with his number one pick? 33:46 Jake and Dave, seasoned axe throwers: This duo was found practicing their craft, but it is difficult to notice who is the teacher and which has only been throwing since January. These guys love the thrill of the tournament style throwing and challenge any axe-pro. 43:05 Cousin Lisa, SinBinKreations.com: With a new website to tout for everything from ice scrapers to park benches made of hockey sticks, Cousin Lisa threw some axes and is now contemplating a hockey stick handles axe for throwers! She customizes her wears AND gives proceeds to the Lemieux Foundation for its constant support to all those in need. 49:35 Anthony Edmonds, Chef, co-owner, FairyTalesHotSauce.com: While we didn’t meet him at his Florida home, we did get the low down on why Fairy Tale sauce is such a hot product. The Mt. Lebo native misses his ‘burgh roots but is on fire in Florida using his sauce on many recipes and over ice cream! Thanks To: All for social, video and photos.